If you are unfamiliar with the novel, turned movement, turned movie, the basic premise is attempting to change the world by doing someone a favor, not to receive something in kind but instead instructing the recipient to simply “pay it forward”. I believe in this concept. I have felt it as a payer and as a payee and I believe in it. Perhaps more importantly, I believe in humanity. I believe we all have the capacity to do great things not only for ourselves but for others as well. I’d like to share a story with you. On Wednesday, October 19th I had finally crawled out of my dark depression cave enough to be a close approximation of my “normal” self. I was able to crawl out of that dark place in part because of people commenting on here, but also my many friends and supporters’ tweets that helped me feel not so alone and despairing. As I was reading through my Twitter feed, a tweet caught my eye. I’ve been following Misty Provencher for some time and I love her avatar so I slowed my scroll and read her tweet. The words “lost” and “agent” worried me so I clicked on her blog link and got sad. As some of you know, I am writing a young adult novel. In fact, I’m doing line edits (ay caramba and a half!) before sending it out to be beta-read. In the writing gig, if you want to be published in the traditional market, you must have an agent (unless you are already famous, in which case you probably already have an agent — I’m looking at you Snooki and Tyra Banks.) So to read of an unpublished author losing her agent and knowing the heartbreak Misty is going through made me very sad for her. It is the stuff of nightmares for writers trying to get their novel-babies into the reading world. And you know what, her book is great. I have read the chapters she’s released and I’m hooked. (Each chapter is a tab at the top of her blog.) If it were published, I’d buy it as a hardbound for goodness’ sake. So if you read fiction, please give her novel, Cornerstone, a read and if you like it, let her know. And then forward it to all your friends and ask them to read it. Pay it forward. Anyway, I’ve retweeted her blog posts as she has uploaded chapters and each time she thanks me. The other day she thanked me again and I basically tweeted, “just pay it forward”. Another Twitter friend joined in the conversation and Shadowflame1974 recalled a time she had paid it forward. It got me thinking about how when we connect with folks, especially when we pay it forward even in small ways, we give gifts. Real gifts to everybody, including ourselves. Because that’s what is great about people and this world we live in — when we do good for someone and do it not for ourselves but just to help someone else, we are all better for it. Last Sunday I gave my students an assignment. I drew a dot on their hands that looked just like this photo. The first time I did this was back in my speech coach days. I had a particular kiddo who was absolutely terrified to compete at our first tournament even though her piece was ready, she was ready, and she was good. Without thinking, one afternoon I grabbed my ballpoint pen and made a mark on her left hand which held her notecards. For my students last Sunday, I asked them to remember what their gifts are and to remember to use them. I put one of these marks on my hand often; so often in fact that I should have it tattooed on my hand in spite of my “no tattoos on hands” rule. I use it to remind myself that I have been given gifts, even if I don’t know what my gifts are. I know I will not be the person to change the world by curing cancer or AIDS, or reducing our dependence on petroleum or saving the polar bears. But that is okay. Perhaps my gift is simply inspiring someone else to pay it forward who will pay it forward who will pay it forward and on and on until the world is filled with gifts. This entry was posted in Front Page, Writing and tagged Catharine Ryan Hyde, Cornerstone, Misty Provencher, Pay It Forward, Shadowflame1974 by kristina. Bookmark the permalink. This is what I love about you. You’re so resilient; you see the light at the end of the tunnel. You’re beautiful, just like this story. I’m going to put a dot on my hand. As for paying it forward, I always try to do my best to be a good person, even though sometimes I fall short. It’s always good to see how people can & do make the world just a little better place, for all of us, just because of everything in general and nothing in particular. And it’s good to be reminded that WE ARE THOSE PEOPLE. And see there, you just were one, right there, right now. WOW, Kristina. What do I say to you besides WOW and THANK YOU and WOW. I’m drawing a dot on my hand right now…you blew me away. 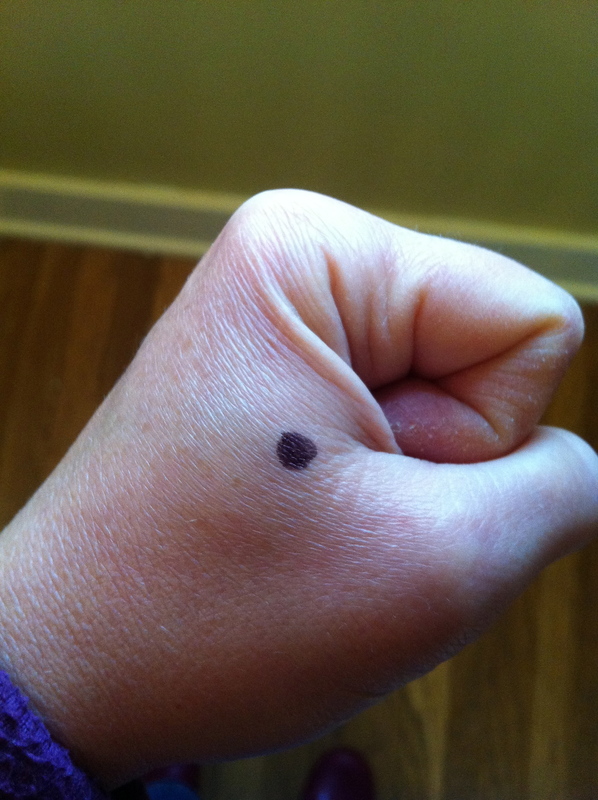 I’m so glad you’re in the teaching profession- I wish every kid had you there to draw a dot on their hand. I can’t say enough. Thank you for mentioning me. I am beyond honored and grateful. What a beautiful post 🙂 I love the dot idea – let it be whatever you need it to be! Nicely said. Someone once told me to make sure to leave a place in better shape than when I got there. Never thought of it as ‘paying it forward’, but now I will. 🙂 And perhaps every now and then I’ll dot my hand. Wow. Just Wow. Awesome….this is why I love you and your blog. Always here….Always reading…paying it forward every day. Kristina, I always read your blogs, but I don’t know if I’ve ever responded to one of them outside of a comment or two on FB. This one moved me to do so. First, I love the idea of letting …whatever, move you in the Library. I’m there ~ once a week & have never tried this, but will. Secondly, I am glad to hear that the support of others has helped to get you out of a sort of “hole” that depression can make. I have been there, and know all too well the difference a community of friends can make. Lastly, the group that I belong to, that got me, and is keeping me sober, is motivated by a “Pay it forward” stance. We are given great knowledge, strength, & community, and it is our obligation, duty, responsibility, however you want to phrase it, to be there for those that come after us. We also do a tremendous amount of service work, both within our community and outside of it. I truly believe that this sense of getting outside of ourselves gives us a sense of purpose, even to those of us who feel broken. There is so much positive power in that, it is impossible to ignore. I commend you for acknowledging this. It is lost on so many in our society.